Diva, We are looking for new carpet. I have not found a carpet I like yet, but my husband likes the Home Depot carpet installation prices. Is this a good place to buy carpet? Do you have any tips? Janet, rest assured Home Depot carpet installation prices are fair. Because Home Depot and other large home improvement warehouses compete to have the lowest prices, they usually offer good deals. That’s not to say that when it comes to the material that some carpets may be a better price than others, but just that over all their prices are low. Most Home Depot stores offer excellent customer service, but here a few things you should know about if you are getting carpet installed from them. What is the lead time? Ask the associate how long you can expect to wait from the time you set up for a carpet measure until the carpet is installed. This is especially important if you have an event coming up that you need new carpet for. A lot of times the lead times Home Depot advertises is for the time frame carpet takes to get installed after the professional measure. Typically a professional measure can take anywhere from one day to one week. Ask who to contact if you have questions or problems. Get a backup, especially if you’re in a hurry to have your carpet installed. This way you know who to call if what was supposed to happen hasn’t happened yet. A lot of times your initial sales associate can help you, but you should also get the number to the install coordinator or special order expeditor. This is the person who can help you when your sales associate is off and they also have a direct line to the installers/carpet manufacturers. Be proactive. Let me repeat that, YOU NEED TO BE PROACTIVE. If you haven’t heard from someone in an expected amount of time, you need to call them during business hours while they can still get answers for you. Calling after 5pm will do you no good. For example, let’s say you are having a wedding at your house and the carpet needs to be in before that happens. It’s two days before the wedding and you have been promised by the Home Depot associate that the installer will call you today to set your appointment for installation. Call the associate back before 3pm to let them know you have not heard from the installer yet. Since you’ve called before the office staff went home you have a better chance of being called today. If you wait until 5pm, the associate can not help you. If I had a dollar for every time a client called me after business hours because an installer didn’t call them back I’d be a very wealthy diva! One last thing to keep in mind is that the advertised prices are for basic installation only. This means that the price would only be for a carpet install on bare subfloor with pre-existing carpet tack strips. There will be an additional installation fee for stair labor, removal and haul away of old carpet and pad, transition strips, hard access or carpeting of a trap door or other such obstacles. You can assess some of these charges just by talking to a Home Depot associate and get a bigger picture of what the installation will cost. 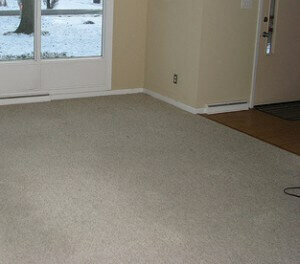 The most common additional charges are for stair labor and removal and haul away of old carpet and pad. Typically speaking you can estimate $8-10 ea for standard steps and $.25 per/square foot for carpet and pad removal, but ask your sales associate to give you a better quote. Do you have questions about the selecting or the installation of: tile, carpet or wall treatments (window blinds, etc)? Then email me your tale of woe (diva (at) homemakeoverdiva.com) and perhaps I will be able to answer your questions right here at the Home Makeover Diva Blog.